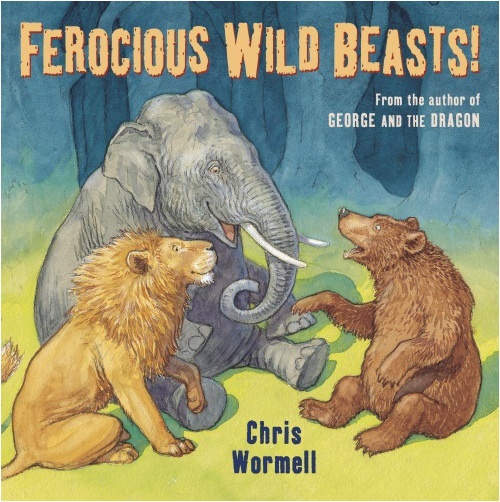 Several of his titles—including his latest, only out thus far in the U.K., One Smart Fish, and his latest title here in the U.S., Ferocious Wild Beasts! (Random House, December 2009)—are featured here at The Guardian. He also discusses a bit of his artistic process over there (including a glimpse at his 1846 Albion press), as well as below. So, let’s get right to the interview then. 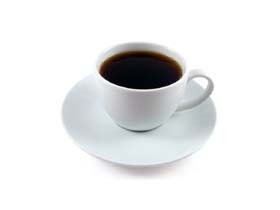 Chris’ breakfast-of-choice this morning? “Bacon and egg or pancakes, though mostly I have a rather boring cereal,” he told me. Sorry, but I didn’t hear anything past “pancakes.” Oh twist twist my arm. Sure, I’ll have some pancakes with Chris. Let’s get to the interview. First, we’ll set the table and get the basics from him before our six (we’re one shy this morning) questions over breakfast. I thank him kindly for stopping by. 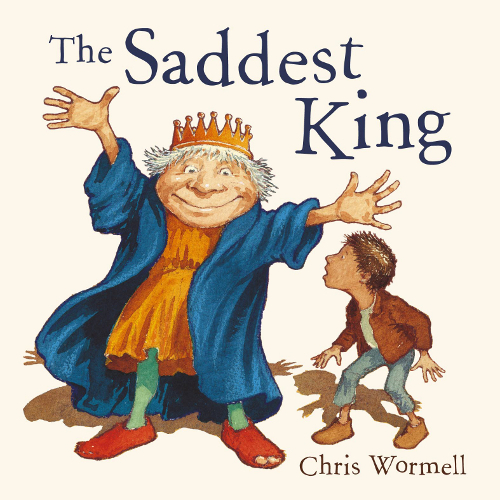 Chris: Most recent books are: One Smart Fish, 2010; Ferocious Wild Beasts!, 2009 (just out in the U.S.); Molly and The Night Monster, 2008; The Animals Came Two by Two, 2008; The Saddest King, 2007. ‘But, er . . . they couldn’t squish an elephant, could they?’ asked the elephant. 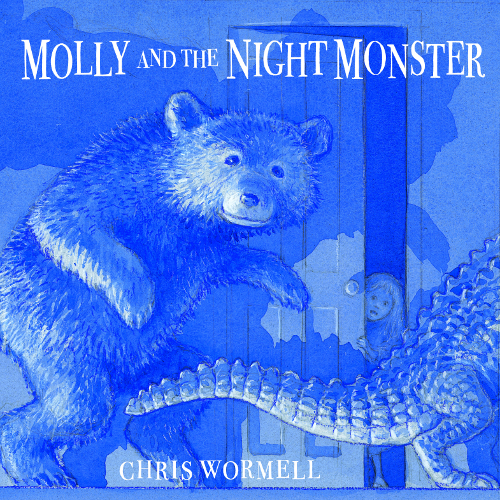 Chris: For picture books, my usual medium is watercolour, pen and ink, and coloured pencil or lino cut prints. I also cut wood engravings. I don’t prefer one medium above any other but use whichever is best suited to the book. 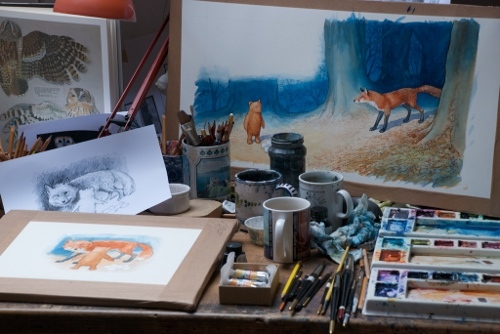 Picture book stories are mostly illustrated with watercolour and coloured pencil and sometimes pen and ink. The commercial illustrations I do are usually prints. 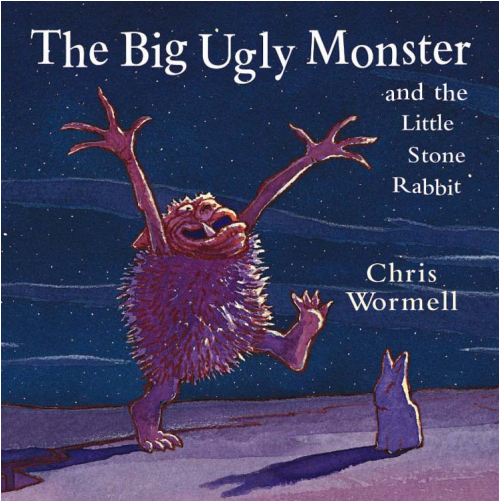 Chris: I don’t think that I approach illustrating a picture book for younger children any differently than I would an adult book — or even a commercial illustration for advertising or design. I may subconsciously work in a different way, but I can’t say that I’m aware of it. 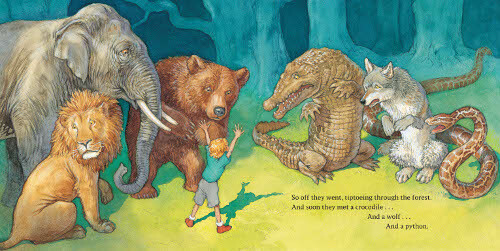 In a book for young children, there are obviously things I bare in mind: I try not to make characters, such as monsters, too scary (though I often do and my editor has to remind me about this!). But that’s more about subject matter — not technique. This chap didn’t make it passed my editor … Understandably! 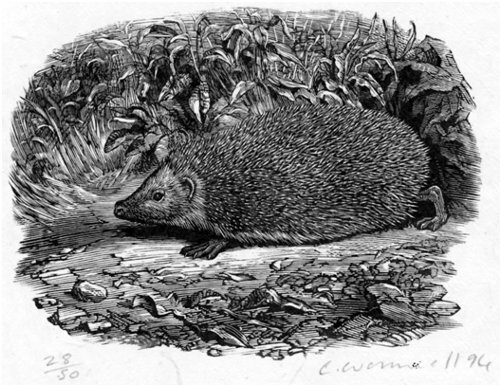 Chris: I live in London in the U.K.
Chris: I’ve always been a bit backward-looking—inspired more by the past than the present—and, when I was a child, some of my favourite pictures were the little wood engraved vignettes of Thomas Bewick (1753 – 1828). 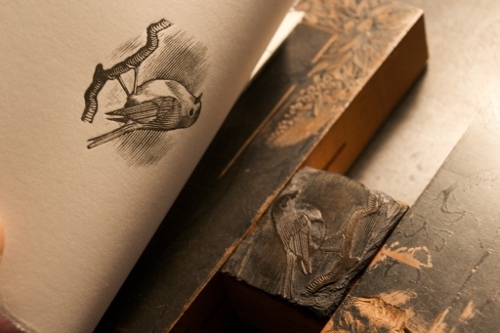 When I decided to have a go at book illustration, it was to wood engraving that I turned. I hadn’t gone to college and hadn’t much idea of current trends in illustration — otherwise, I might not have decided on wood engraving. It wasn’t terribly fashionable at the time. However, I was lucky, and after producing a few prints and sending them to publishers (lots of publishers), I was eventually commissioned by Faber and Faber to do a book cover. More commissions followed, I got an agent, and—after ten years or so of commercial illustration—I began writing picture book stories. 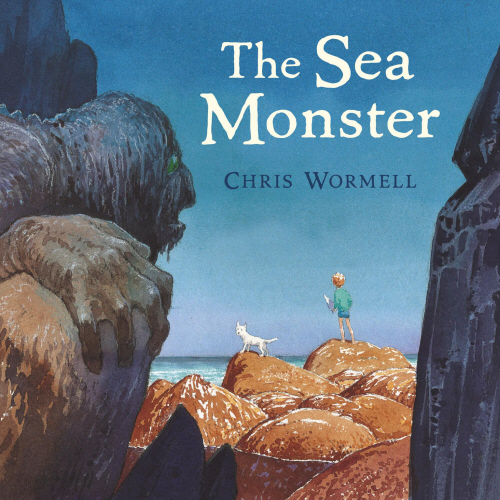 After writing my first story, I phoned Tom Maschler at Jonathan Cape; I’d done some illustration for Cape already and Tom had said that if I ever had any ideas for stories to give him a ring. He liked the story, and I’ve been publishing stories with Cape ever since. Chris: I’m way behind the times. My web site will be going live very soon…I hope. It will be: www.chriswormell.com or www.chriswormell.co.uk. Both should work, I think. Chris: Yes, I do school visits. I read some of my stories, talk with children about writing and drawing picture books, and have some fun drawing pictures for them. 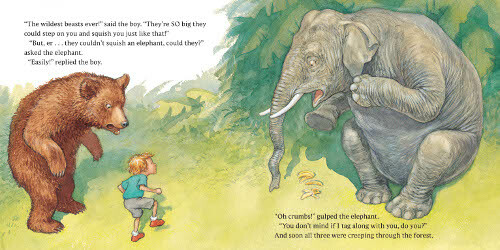 You learn a lot about storytelling by story-telling, and what children have to say is always worth listening to. Hopefully, the children find the visits rewarding. I know for sure that I find them inspiring. 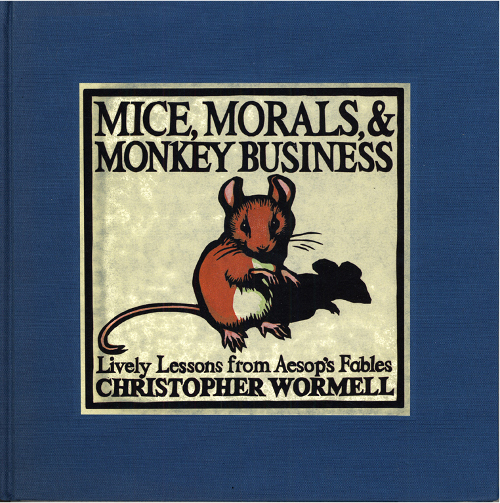 Chris: I’m working on a book right now that’s called (so far at least) Six White Mice. 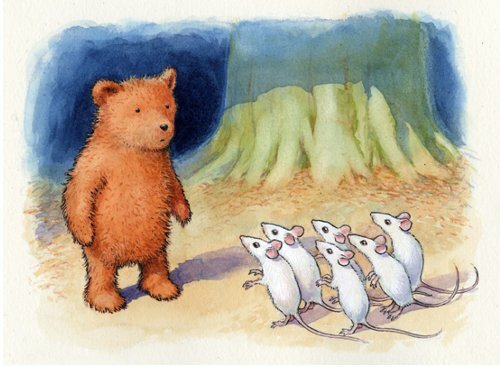 It’s about—guess what—six white mice … and also a scruffy little bear. Our table’s set now for our breakfast interview, and we’re ready to dig into our pancakes. Let’s get a bit more detailed, and I thank Chris again for stopping by. 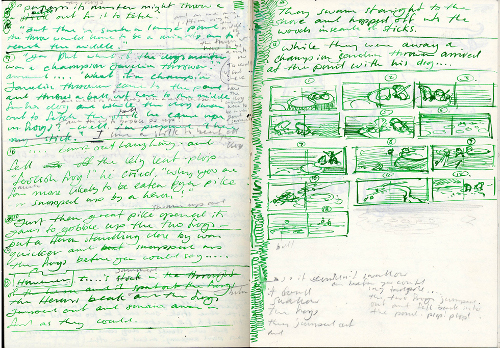 Chris: When the beginning of an idea occurs to me—it may be a visual idea, a character or place, or it may be the first line of a story—I jot it down in a sketchbook. Nothing may come of the idea. But it may, with luck, grow into a story –- days, months, or even years later. I never plan a story, by which I mean I never know, when I start, what the story will be about. I never set out to write something on a particular theme. I like to discover the story as a reader might. 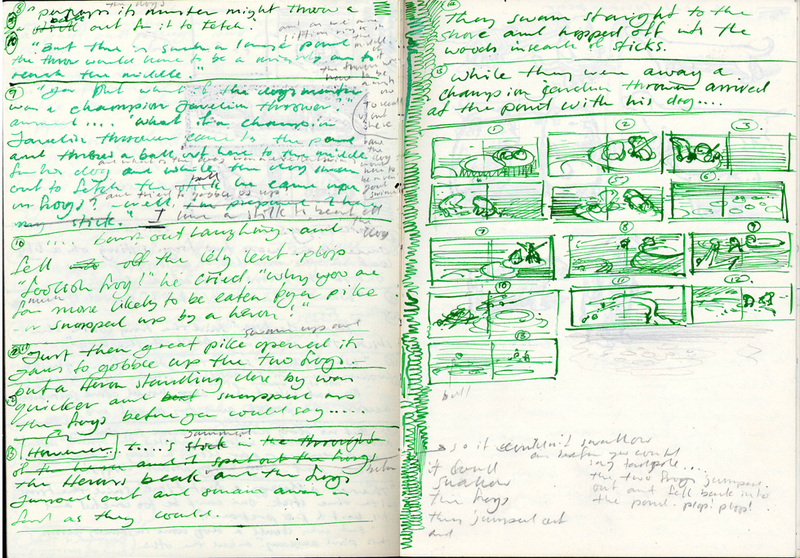 And, as the idea grows, scribbled in my sketchbook, I draw little thumbnails indicating how each spread of the book may be laid out. When I’ve more or less got the story finished—the words at least—I type it up and put the words on a dummy layout. Then I start finding out what the characters in my story look like. This may take a few minutes or it may take days and days. It happens more or less by trial and error. I scribble away until suddenly one drawing—it may only be a few rough lines—comes alive and reveals to me the nature of the character –- how they stand, how they move, their expressions. 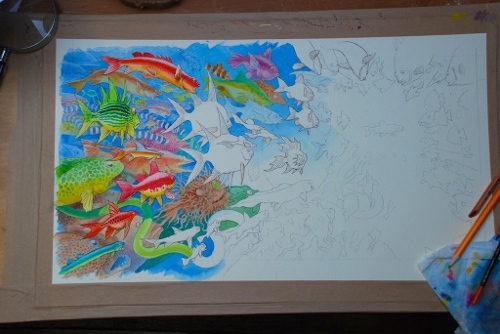 Once I’ve got that drawing, I can go on and draw the pictures onto the dummy layout. This, with many adjustment and changes, becomes a rough dummy of the book. It’s only when I’ve finished the dummy that anyone else gets to see the story. If my wife and children like it, I show it to my editor, and if the story gets the thumbs up, I’ll start work on the finished pictures. Chris: My studio is at the top of the house, with a sky light window in the roof. It’s not enormous but would be a reasonable size (London-townhouse size, that is) if it were not so full of things. I have five tables and a large plan chest, none of which I manage to keep clear. I have shelves full of books and shelves full of engraved boxwood blocks. The walls that remain are mostly covered with drawings by my children. 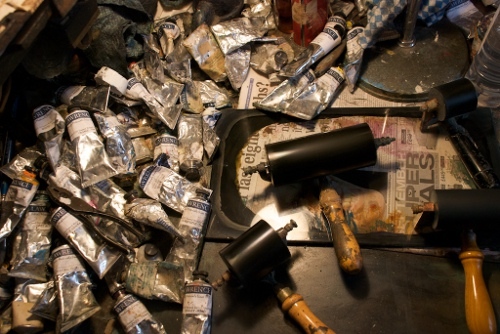 One corner is filled with thirty portfolios of prints, and under two of the tables are the dismantled pieces of two, very heavy cast iron Victorian engraving machines. I’d love to get them working one day but don’t know how to put them together. On one of the tables I have a Mac with a very large screen, which I find invaluable, though I have not, so far, created finished artwork on the computer. 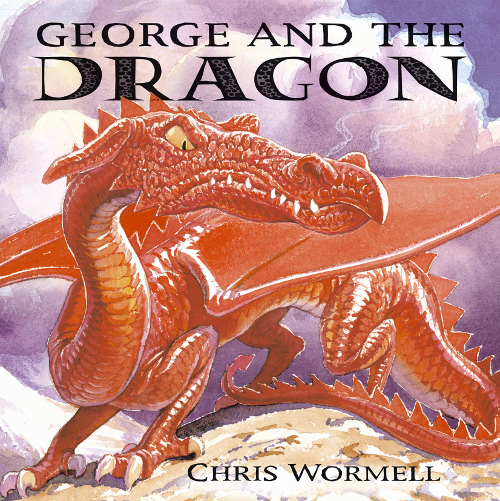 Chris: A few of the books I remember loving as a child are: Alice’s Adventures in Wonderland by Lewis Carroll, The Wind in the Willows by Kenneth Grahame, The Winnie-the-Pooh books by A. 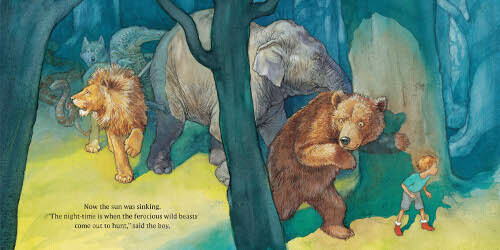 A. Milne, The Narnia books by C. S. Lewis, Dr. Seuss’ books, and Beatrix Potter’s books. I still love all of these books, and I think they have all influenced me. Chris: Not sure it’s a good idea to meet people you really admire — it’s usually their work you admire. But am I allowed animators? I’d quite like to have a go at making a stop-motion animation film one day, when I have some more time. (By all accounts, they do take time.) And one of the people I really wish I’d had the chance to meet was Oliver Postgate, who made beautiful little stop motions films in the ’60s and ’70s and is possibly my all time favourite storyteller. Sadly, though, he died a couple of years ago. 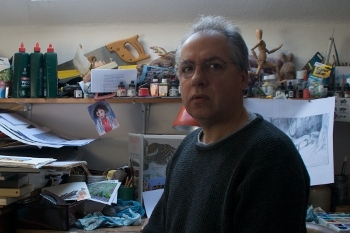 I’d be interested to meet Nick Park, though, creator of the wonderful Wallace and Gromit films. 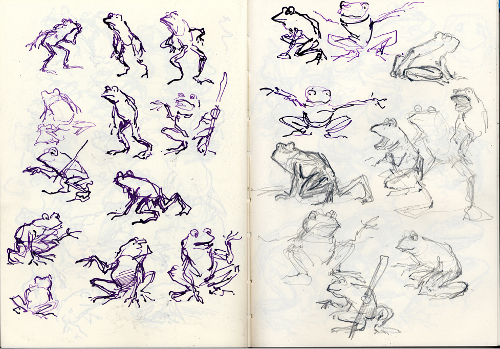 And I’ve recently been looking at some of the animated films of Jan Švankmajer. He has a fantastic imagination and would certainly be interesting to meet. Chris: I find it easier (not that it’s ever easy) to write with silence, but I do listen to music while I’m making pictures. This is some of the music I’ve been listening to recently: Ravel pieces for piano, Shostakovich – 24 preludes and fugues, Vaughan Williams – Symphony No. 8, Steve Reich – Music for 18 Musicians, and various Tom Waits albums. Chris: Can’t think of anything interesting that most people don’t know about me. I wear size eleven shoes. Will that do? Chris: “Yaffle” is a good word. I’ve just discovered it’s another name for a Green Woodpecker. 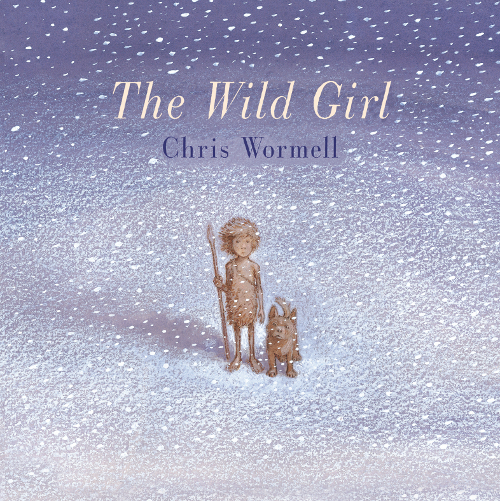 Chris: A good story, a poem, a play, a piece of music, a walk in the woods, a swim in the sea, a climb up a mountain, a glass of wine, the company of family and friends … a deadline. Chris: I would enjoy being a gardener. Chris: Once, when I was young, I worked in a brief case factory — at the end of the production line and spent eight hours a day hoovering out the insides of finished brief cases. I think it was the most boring thing I’ve ever done in my life (and I’ve done some fairly boring things). I wouldn’t like to have to do that again. But I don’t suppose factory work counts as a profession, does it? Chris: Just “hi” would be fine. 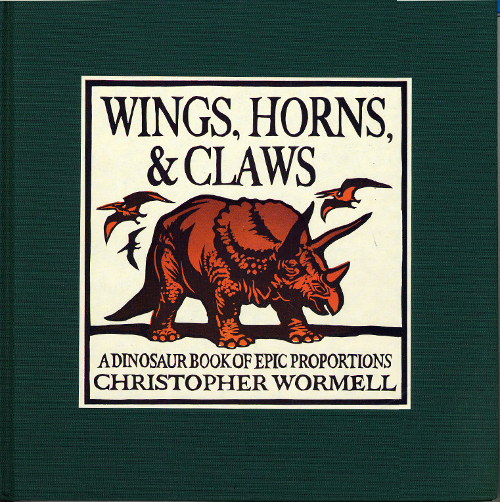 All artwork, sketches, and photos used with permission of Chris Wormell. All rights reserved. Wonderfulness! 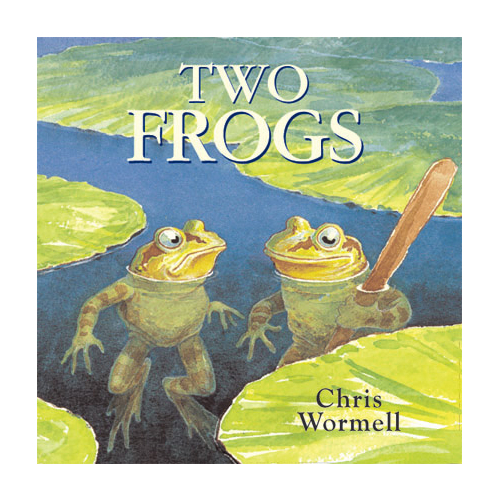 I LOVE Mr. Wormell’s work. (Who wouldn’t?) His lines, shapes and colors are simply perfect. 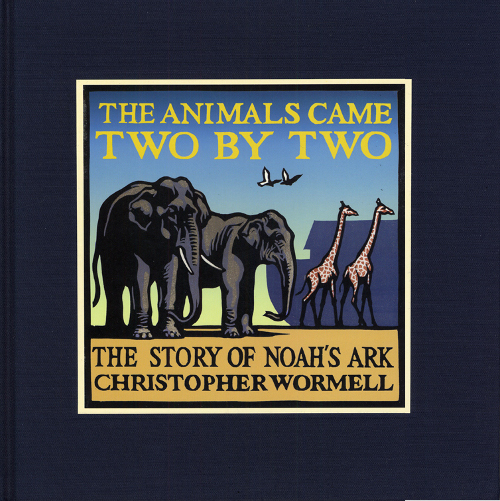 I can’t resist buying children’s books with linocuts, so I am lucky enough to own a couple of his. 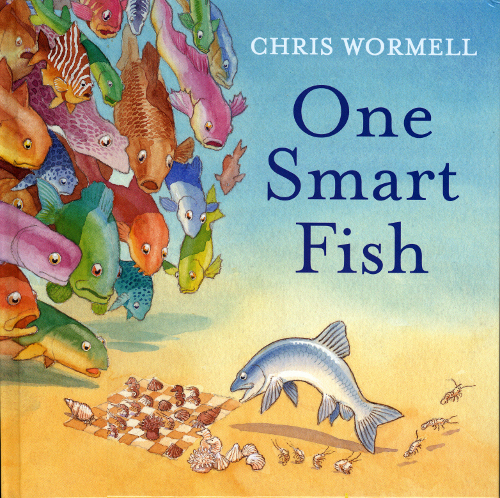 One Smart Fish looks fantastic. I want to see inside! I like the sense of excitement in his works! They all have a “and then what happened?” feel to them. Another fascinating post, Jules. Chris is an amazingly talented artist — truly breathtaking illustrations. And I’m feeling much better about my terribly boring work this week, after thinking about how much worse it would be to work in a brief case factory! Thank you for the feast for the eyes. Too cool! 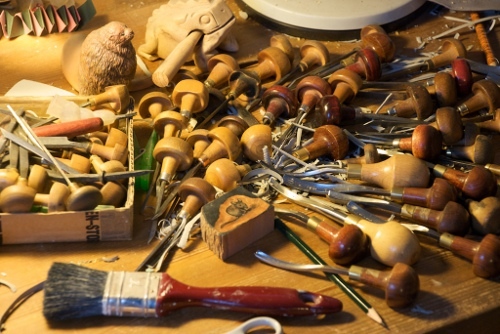 Love the view of the wood/lino tools and in-progress stuff. That woodcutting process must be painstaking. 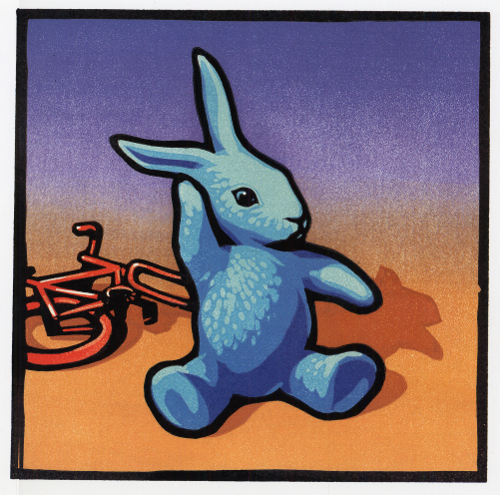 Oh, look at that blue bunny and little scruffy bear! Thanks for the intro to yet another amazing artist, Jules. “I’d like to have a go . . .” so British. Love it! 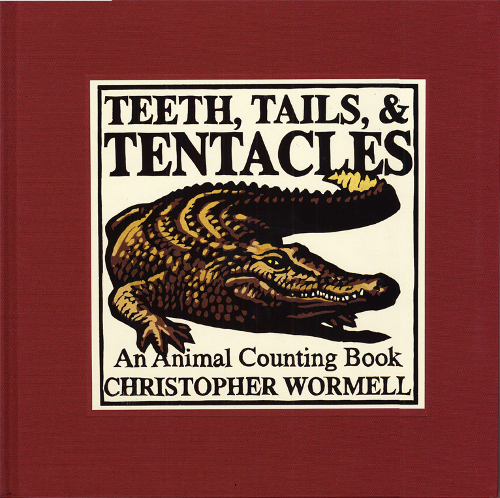 Chris Wormell’s work has been an inspiration to me for many, many years. Achingly beautiful. Thanks Jules for featuring his amazing talent! Thank you for such a lovely, inspiring interview! I particularly love his woodcuts, but I’d be so happy to have any of his work hung up on my walls – his illustrations are so beautiful. 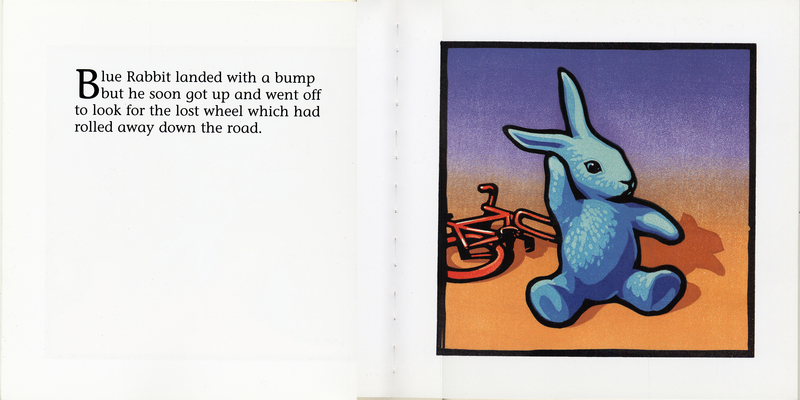 LOVE the blue bunny books! 🙂 so facinated with woodcuts and linocuts….wish I had the talent! Sheesh, Chris has a great hand and eye!